Eid-ul-Adha is just around the corner, and this means it is time to shop for those show-stopper outfits. 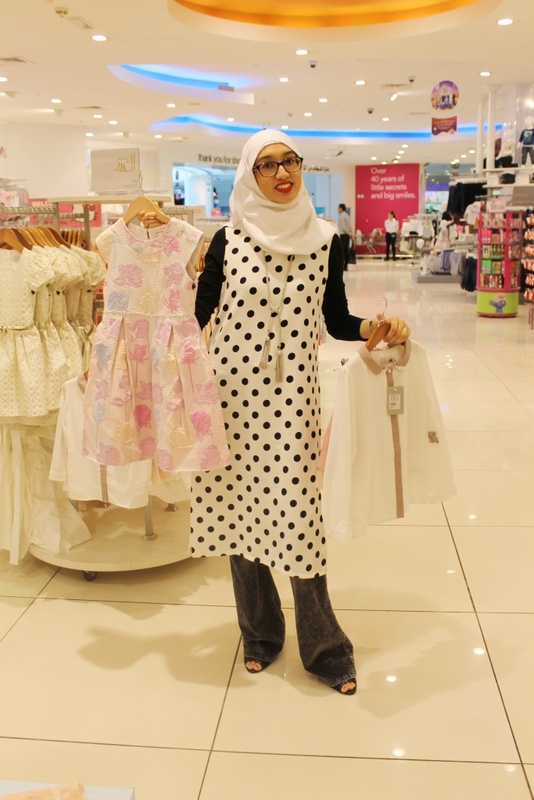 When it comes to dressing up my toddler, Babyshop is always my first stop thanks to their stunning designs at affordable prices, and since they have just launched their new Eid Collection, I simply could not resist taking a peek. I headed down to their Oasis Mall branch in Dubai to see what they had in store, and was greeted with the Eid Collection for boys as soon as I entered. 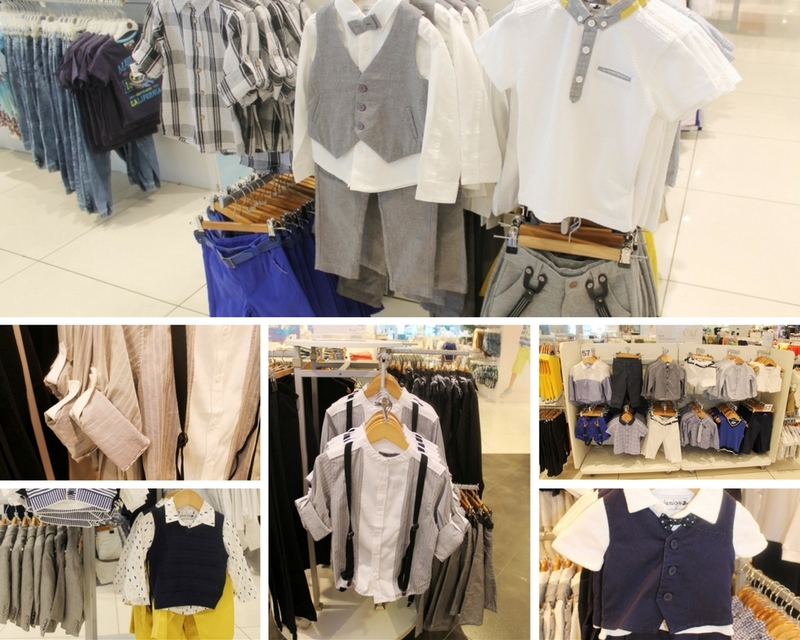 For their new Eid collection, Babyshop has a mainly monotone theme running for the boys outfits, with a focus on waistcoats, bow ties and my favourite of all, suspenders! 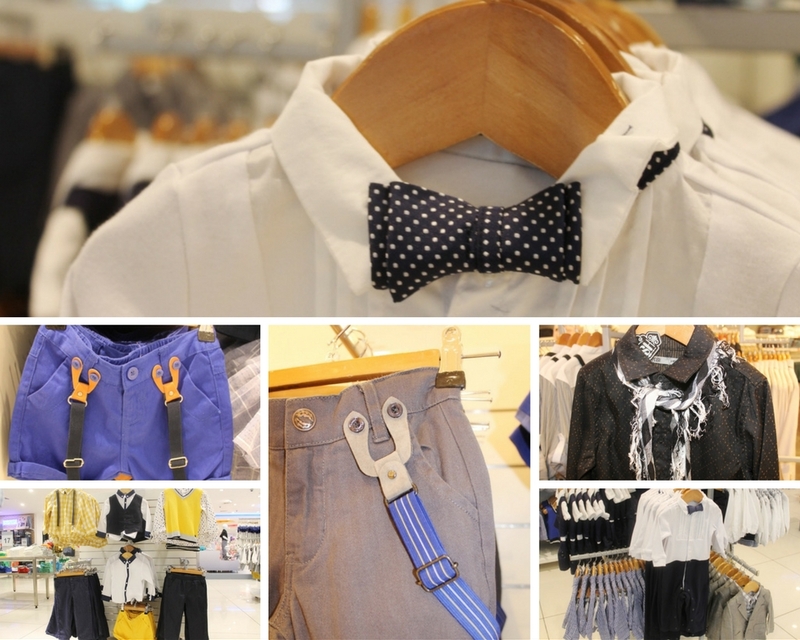 There’s something so smart and dashing about a boy in suspenders, wouldn’t you agree? However, for those that prefer colour, there are pops of royal blue and bright yellows to make your boys stand out from the crowd. As well as formal pieces, there are some great smart-casuals too for boys that don’t enjoy the fuss, like my little one! I absolutely adore the royal blue shorts with suspenders (pictured above) paired with an equally bright yellow shirt for that royal look resembling Prince George! 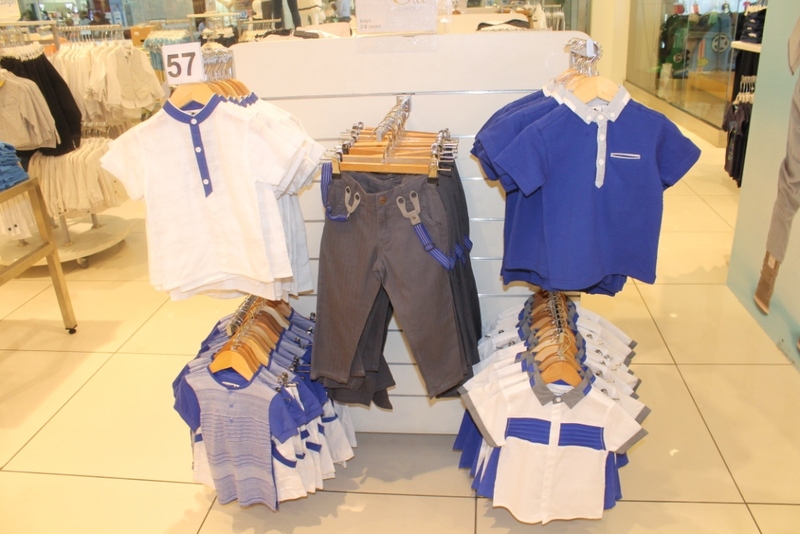 There’s also a great selection of crisp white shorts and shirts, but be warned, boys will be boys, and with Eid treats being savoured all day, there may be a chocolate stain or two! The theme of monochrome designs extend over to the collection for teens too, pairing formal shirts with attached suspenders, a patterned scarf, or simple black tie. I also especially loved the selection of grey waistcoats, with varied patterns, to spruce up any outfit for Eid. Over all, I think you are spoilt for choice, and with such a great selection, your handsome boy will surely be the talk of the Eid party next week! 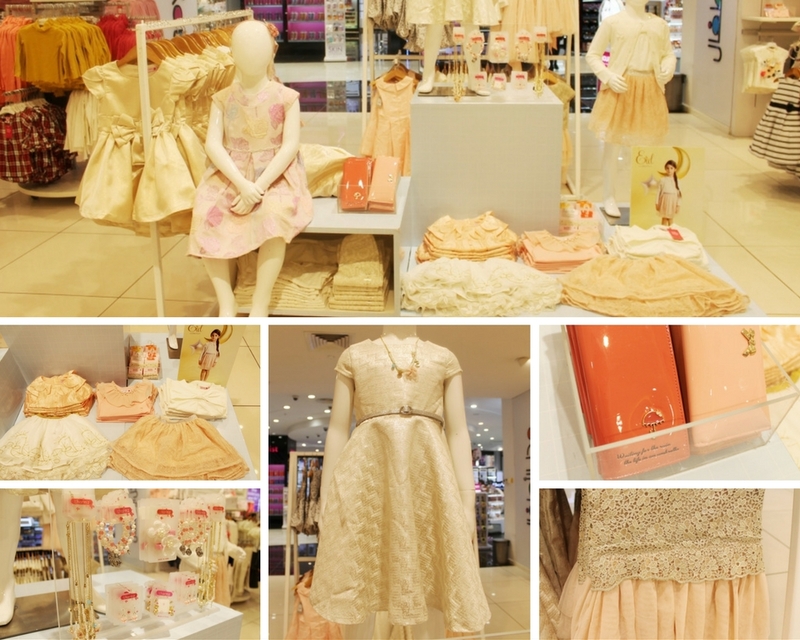 The collection for girls is no less enticing, and I quickly found a theme of pastels and golds running throughout. Eid is all about shimmer and there sure is plenty of it in this collection! 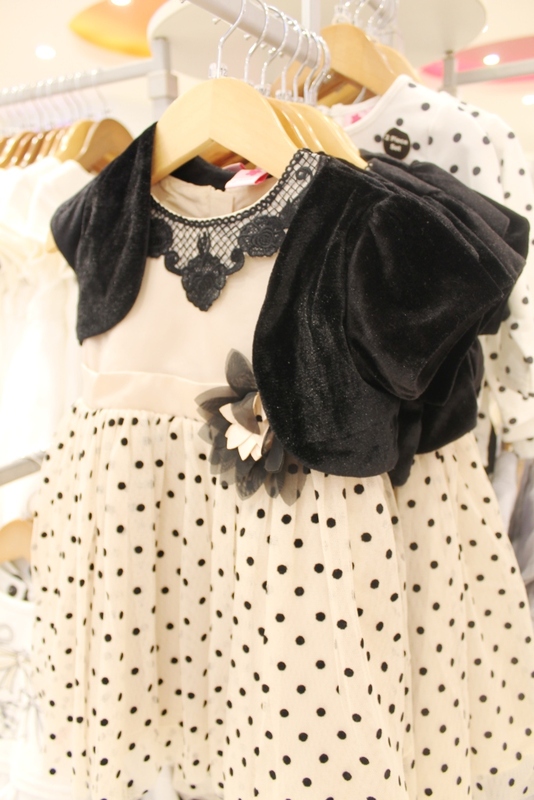 For toddlers, there are plenty of pearl accessories to pair with their gowns and add the extra touch of glamour for Eid. Of course, I also saw plenty of floral patterns too, amongst the luxurious laces and extravagant bows. 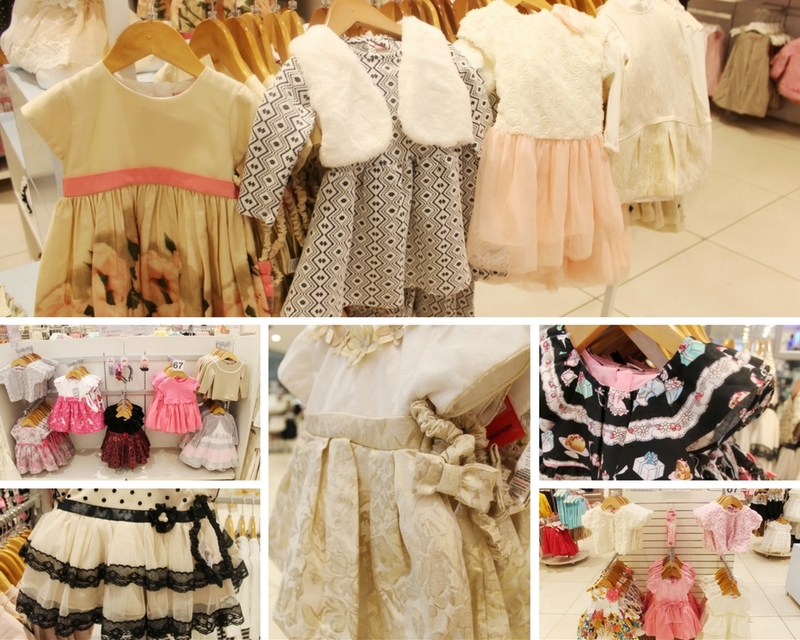 The dresses for baby girls and toddlers include lace and frills a plenty, and what I loved most was that the majority of frocks came with matching hair bands that are silky soft for your little princess to be crowned. This striped black and white frock (pictured above) is my absolute favourite pick because it reminds me somewhat of a regal “Breakfast in Tiffany’s” look, and is simple yet sophisticated thanks to the diamond detailing on the collars. 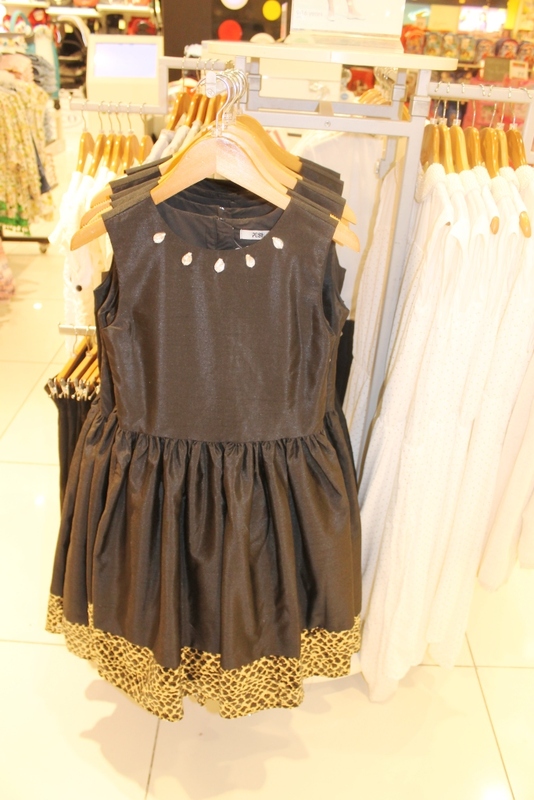 For teenage girls, how could they not include an LBD (Litte Black Dress) that is a staple in every girl and woman’s wardrobe, and this one pictured above has a stunning gold detail at the bottom to add extra glam for the Eid occasion. 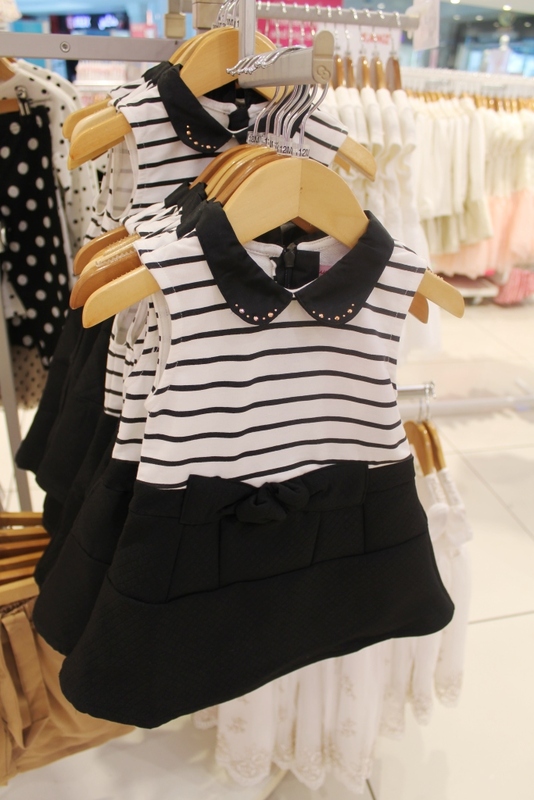 I also spied a white polka dot dress with pearls stitched on the entire collar, and wished they had one of those in my size! Over all, the Eid collection for girls is simply stunning, and as if the frocks and dresses weren’t enough, there are fur cardigans with tiny diamontes for more shimmer and sophistication. With such a wide and splendid choice for outfits to dress up your doll in, you may be there for a while trying to pick and choose which one you like best. 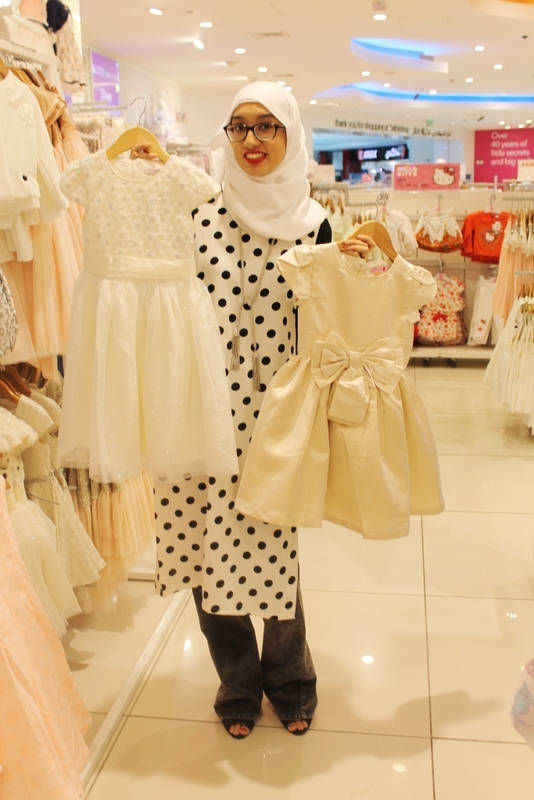 You can check out the short video of me cruising my way around Babyshop as I pick my favourites from the Eid collection, below, or why not head on over to your local Babyshop to check out the extensive Eid collection for yourself! For more details, check out the Babyshop website, or follow them on Facebook, Twitter and Instagram for the latest updates. Note: This post is written in collaboration with Babyshop Arabia, however all views and opinions expressed above are honest and solely my own.